I know it's been a while since I've updated my blog but I took most of August off and reallllllllly enjoyed recharging my creative batteries. Autumn should be an amazing time for stamping, and boy am I ever looking forward to school starting again :) My youngest is only doing half-days but that's better than nothing, as many of you know! What's new in SU Land? Stampin' Up! 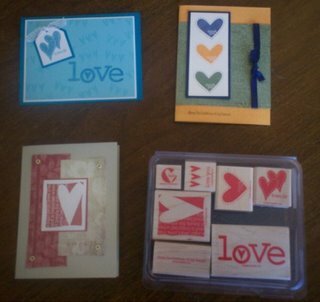 has launched it's "Love Your Heart" promotion and has produced a unique, 7 piece stamp set called "A Light Heart" ($27.95 CDN) to help raise needed funds to combat heart disease. For every stamp set sold in Canada, $3 will be donated to the Heart and Stroke Foundation of Canada and all my personal commission is being donated as well. As mentioned in my newsletter, here are some of the cards we'll be making at my fundraiser stamp camp coming up at the end of the month. We'll be making a total of 5 cards, enjoying a few hours of heart-healthy snacks and stamping with friends... how can you resist? Please contact me anytime for more info!